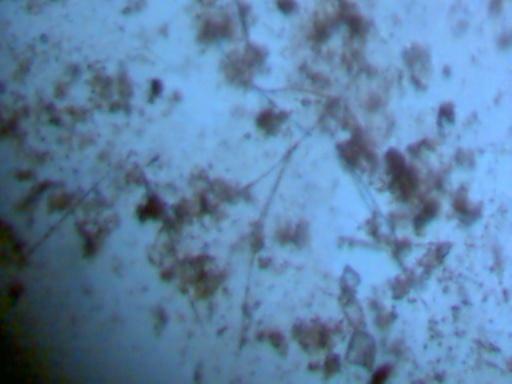 The following photographs of rainwater concentrate as viewed under the microscope are now offered to the public as a complement to the initial investigations recently presented on this website. 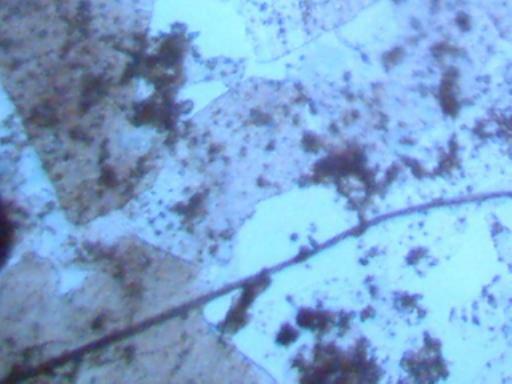 The majority of the photographs are taken at a magnification of approximately 500x, and they depict an evaporated crystalline form as well as a wet slide mount of the samples. Collection of rainwater samples by citizens and the subsequent positive identification of all materials that are being shown is both requested and encouraged. The materials appear to be composed of several distinctive and complex forms. The dominant material appears to be occurring as a metal oxide, which apparently is forming as a result of the heat applied to metal particulates during the distillation process. The evaporated crystalline form on a clean glass slide has a slight pinkish tinge to it. Spherical bodies frequently occur near the perimeter of an evaporated crystal. Isolated occurrences of a rather large crystal also occur along the perimeter. 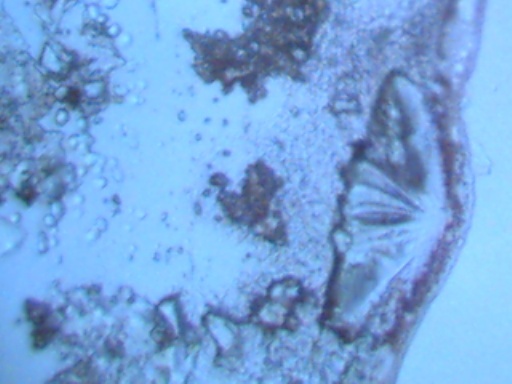 Wet slide mounts make the basic unit of constitution difficult to discern with a light microscope; it appears to be on the order of 1-2 microns in size or less. 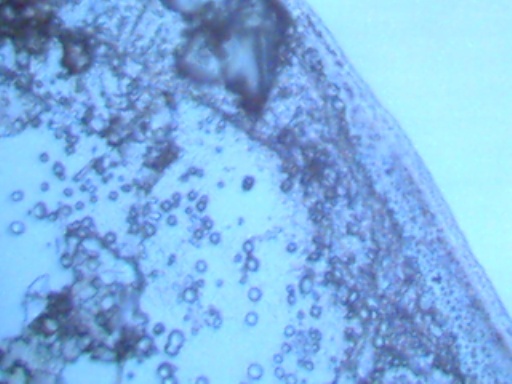 The presence of fibrous material occurs frequently and is easily visible within the wet slide mount. It appears to measure on the order of 1-2 microns (or less) in diameter. As a frame of reference, a human hair is approximately 60-100 microns in diameter and asbestos fibers are on the order of 2-3 microns in diameter. Users may also refer to the initial investigation on this page. Crystal examinations as described on previous pages may also be of interest to readers. 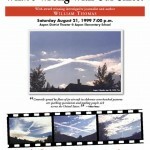 Research will continue on the positive identification of these excessive levels of airborne particulates. 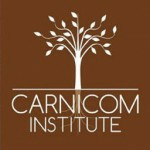 Participation by other citizens within this endeavor will be of benefit. 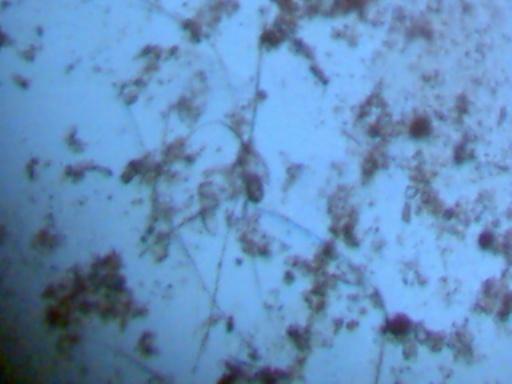 form near perimeter of evaporated crystals. 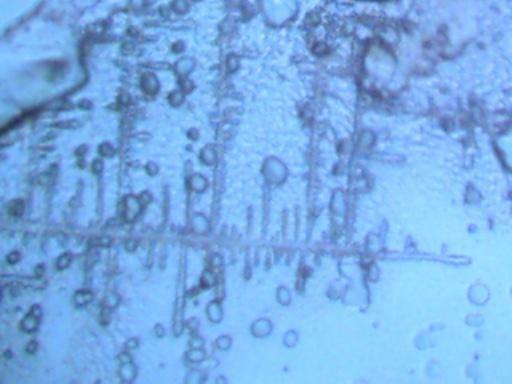 occasional formation near perimeter of evaporated crystals. dominates center of evaporated crystal. Single fiber visible; this size of fiber occurs intermittently. Occurs near perimeter of evaporated crystal. 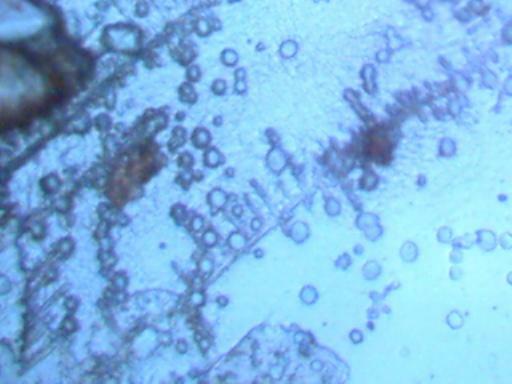 Combination of spherical bodies and large crystal formation. 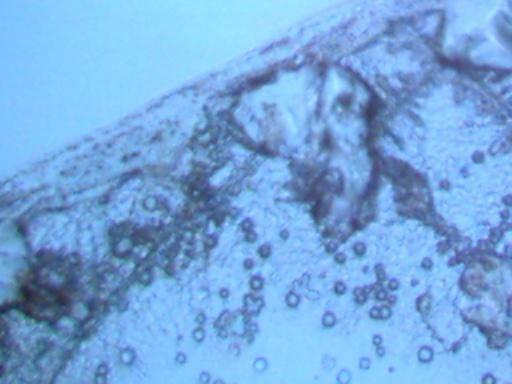 Wet slide mount, magnification approx 500x. 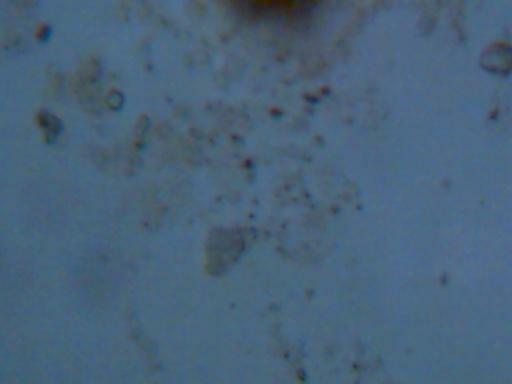 Materials appear generally diffuse, and of extremely small size. Smallest distinguishable unit on the order of 1-2 microns or less. Note definite appearance of fibrous materials. 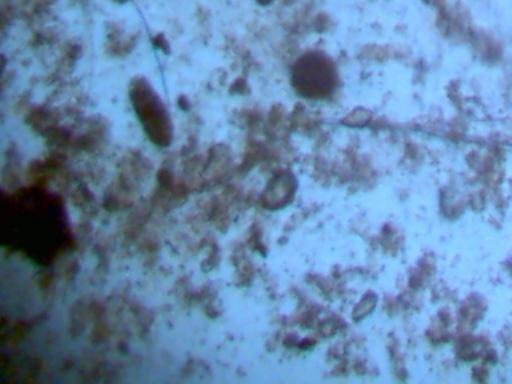 Fibers appear to measure at 1-2 microns in diameter. Representative materials that dominate appearance in a wet mount. Smallest unit of size appears to be on the order of 1-2 microns or less. 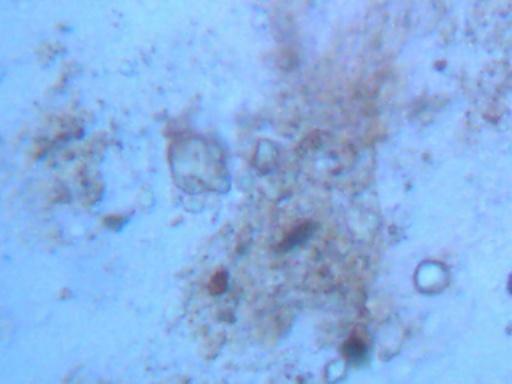 Wet slide mount, magnification approx 2000x. Note high magnification : Individual units remain difficult to discern. Dark spotted materials measure at approx. 0.5 microns.